Even with multiple projects in the areas of carbon offsets, terrestrial sequestration, renewable energy, and switching from coal firing to natural gas, a need may still exist for geologic sequestration of Maryland power plant CO2 to avoid continued releases of large CO2 quantities to the atmosphere. While CO2 is not a hazardous substance, it is an aggressive gas that carries certain risks. Geological sequestration must be approached carefully to achieve the permanent, safe storage of this industrial gas. Carbon capture and storage technologies can be employed to reduce CO2 emissions through either terrestrial or geologic sequestration. Terrestrial sequestration options include eroded and non-eroded cropland, marginal land, mineland, and wetlands and marshlands (see Section 5.2.1). Restoring these areas allows carbon to be sequestered in the soil and in plant matter as it grows. Geological sequestration, on the other hand, involves injecting CO2 into underground formations for permanent storage. The primary types of geological reservoirs are depleted oil and gas fields, unmineable coal seams, and deep saline formations. A potential dual benefit of geological sequestration in oil and gas fields is that the pressurized CO2 displaces residual oil and gas, allowing more of the resource to be extracted. A similar technique utilizes CO2 injection into unmineable coal seams to displace and recover coal bed methane. Another potential sequestration option involves injecting CO2 into (otherwise unused) deep saline reservoirs. Deep saline reservoir injection has two important advantages — potential storage capacity in the U.S. is very large and many reservoirs are close to major point sources of CO2. Sequestration of CO2 in the subsurface can be achieved through either structural mechanisms (i.e., physical trapping) or adsorption storage (i.e., chemical reaction). The ultimate goal of long-term, permanent storage of CO2 is more likely achieved through the chemical adsorption of CO2, and the Maryland Geological Survey (MGS) is engaged in research aimed at identifying reactions that would keep CO2 permanently locked in geologic formations. These reactions include capillary attraction in the small fractures created for gas production, physical adsorption of CO2 known to occur on the surface of rocks containing organic material, and chemical adsorption of CO2 known to occur on the surface of some rocks and with some brines. Unfortunately the first two reactions are not reliable in the long term since they are reversible when subject to pressure swings such as may occur in seismic events. Thus the only ultimately secure CO2 storage is that achieved with chemical adsorption. Within a candidate geologic formation, the most promising strategy appears to be the use of the first two reactions (capillary attraction and physical adsorption) to saturate the formation with CO2 and thus foster chemical adsorption, which is expected to occur over a longer period of time. One additional promising means of storing (and using) Maryland CO2 may be carbon mineralization using fly ash from power plants that does not meet the appropriate chemical specifications for use in industry. This process is an emerging technology that involves reacting coal ash from power plants with CO2 in the flue gas of coal-fired power plants to ultimately create a solid that can be transported and stored permanently. MGS is evaluating this process for potential applicability to Maryland CO2 sources. The increasing global concern over CO2 emissions coupled with the high costs associated with CO2 capture and transport has resulted in a renewed emphasis on large-scale CO2 use rather than just sequestration. In response to its demonstrated effectiveness in enhanced oil and gas recovery, the acceptance of CO2 as a commodity has been encouraged. Many studies suggest regional CO2 use as the best means by which to offset the expense of capture and transport. A North American project that has proven to be a successful end-to-end CCUS operation is the Weyburn-Midale CO2 Project. This project, which began its initial assessment phase in 2000, involves capturing CO2 from the lignite-fired Dakota Gasification Company synfuels production plant located in North Dakota. The CO2 is transported via pipeline 205 miles and then injected into the Weyburn oilfield in Canada. The CO2 is utilized to increase oil and gas extraction from Weyburn, which previously had declining production rates. In the US, most proposed and existing CCUS projects involving enhanced oil recovery (EOR) are located in the southern and western states, where mature oil fields are prevalent. A leading company in this industry, Denbury, has found success in developing CO2 reserves for EOR, and has completed pipelines that enable it to extend its CO2 reserves to the southeast Texas oil fields. In 2012, Denbury began using and storing its first anthropogenic sources of CO2, which are expected to reach 50 million cubic feet per day in late 2016. NRG Energy’s Parish Project, which will inject up to 1.4 million metric tons of CO2 per year from the existing W.A. Parish Generating Station into a nearby mature oil field, located in Thompsons, Texas, for EOR and ultimately permanent storage, which is expected to begin at the end of 2016. While the increasing trend in CO2-EOR activity is promising, the single largest barrier to further expanded use of CO2 in EOR is the lack of available, affordable CO2 supplies. Of the total CO2 currently used in EOR, about 25 percent (12 million metric tons) is anthropogenic in origin – i.e., produced by human activities, such as oil refining or fertilizer manufacturing. The rest is extracted from naturally occurring deposits. The CO2 utilized in the oil recovery process is captured from the production well and recycled, so CO2 emissions are negligible if injected CO2 is stored in the reservoir when production is complete. To date, there have been a limited number of global carbon capture, use, and storage (CCUS) projects that have transitioned from prototypes to successful full-scale ventures. One of the first of these projects is the Sleipner Project. Sleipner is a natural gas field located in the North Sea off the coast of Norway, and the gas produced from this field contains significant quantities of CO2 that must be removed for the gas to be sold. Rather than discharge the CO2 to the atmosphere and pay a significant tax on each ton of CO2 released, the firm extracting the gas, Statoil, captures the CO2 and injects it into a deep saline formation. Long-term carbon storage potential is associated with deposits of so-called “unconventional” natural gas. Geologists have long known about the natural gas resources contained within these formations, but had not considered the gas economically recoverable until advances in drilling technology. 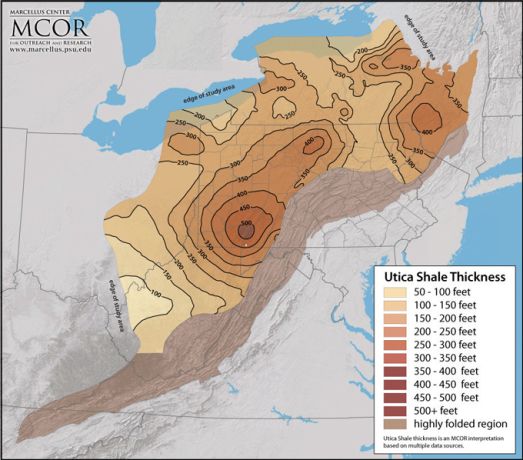 Such resources exist in Western Maryland in the Marcellus Shale formation, a geologic feature in the Appalachian Range that stretches from West Virginia into central New York, and the Utica Shale formation (see Figures 5-9 and 5-10). In fact, there are many shale gas formations, including several others in the U.S., such as the Barnett and the Eagle Ford. 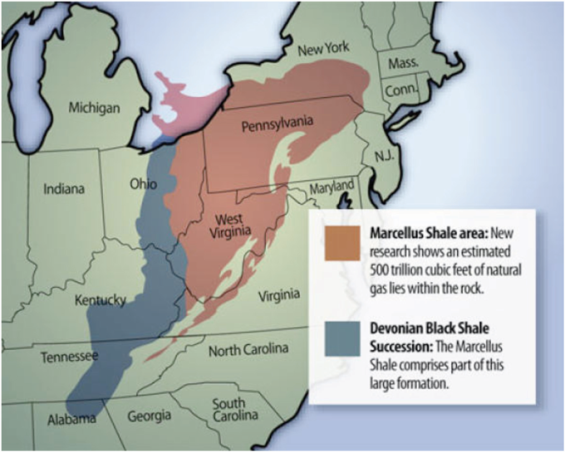 Both the Marcellus and Utica organic shale formations provide the opportunity for permanent, irreversible CO2 sequestration through adsorption in black, organic-rich shales – also called “sticky storage” – and this sorption of CO2 may displace additional natural gas. 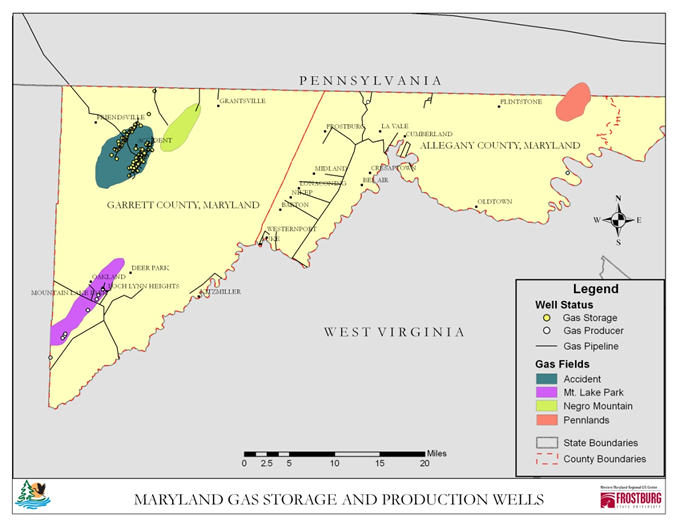 Production wells, however, have not yet been drilled into the Marcellus Shale formation in Maryland. Pennsylvania, Ohio, and West Virginia have begun production of these formations. In December 2014, MDE and DNR issued a final report titled “Marcellus Shale Safe Drilling Initiative Study,” which was undertaken following the Governor’s issuance of an Executive Order to evaluate the impacts of shale gas production in Maryland. The final report provides that the risks associated with developing the Marcellus Shale can be managed to an acceptable level if the recommendations for rigorous best practices for all aspects of natural gas exploration and production are followed. Availability of vast reserves of economically viable, domestic unconventional gas, such as from the Marcellus, is changing the face of the electric generation fuel mix in the United States. Additional gas supply may spur power plants to switch from distillate oil to natural gas at existing combustion turbines, or install new high efficiency natural gas-fired combustion turbines to replace older coal- and oil-fired units. Whether through fuel switching or the development of new natural gas-fired units, the Maryland electric power industry has begun to experience a shift as natural gas resources displace coal resources throughout the PJM region. The U.S. Energy Information Administration predicts that by 2035, total domestic production of natural gas will grow by about 20 percent, with unconventional gas resources providing around 75 percent of total U.S. gas production. To expand its involvement in regional sequestration opportunities, Maryland joined the Midwest Regional Carbon Sequestration Partnership (MRCSP) in 2004. The MRCSP was established by DOE to assess the technical potential, economic viability, and public acceptability of carbon sequestration within a nine-state region — Indiana, Kentucky, Maryland, Michigan, New York, New Jersey, Ohio, Pennsylvania, and West Virginia. The MGS represents Maryland in this Partnership, and DOE provides the funding for any CO2 geological research done in Maryland. Through its Phase I and Phase II research, the MRCSP determined the estimated carbon sequestration capacity of black shales in the Appalachian Basin may range from 2.2 billion tons to 29.68 billion tons, respectively (2010), based on the assumed storage efficiencies of either saline aquifers (3 percent) or continuous coals (up to 40 percent). Phase III of the MRCSP work is currently underway and involves injecting one million mT of CO2 over four years to assess potential storage capacity, validate computer models of subsurface geology, develop formation monitoring techniques, and to provide information to better understand similar rock formations throughout the region. In addition to shales, basalt formations have also been identified as potentially effective CO2 adsorption sites. Dense interior layers function to trap the injected CO2. Laboratory studies show that within a matter of months, CO2 chemically reacts with minerals in the basalt to begin forming calcium carbonate crystals. DOE estimates the US and portions of Canada have potential capacity in basalts to store as much as 5,700 years of CO2. 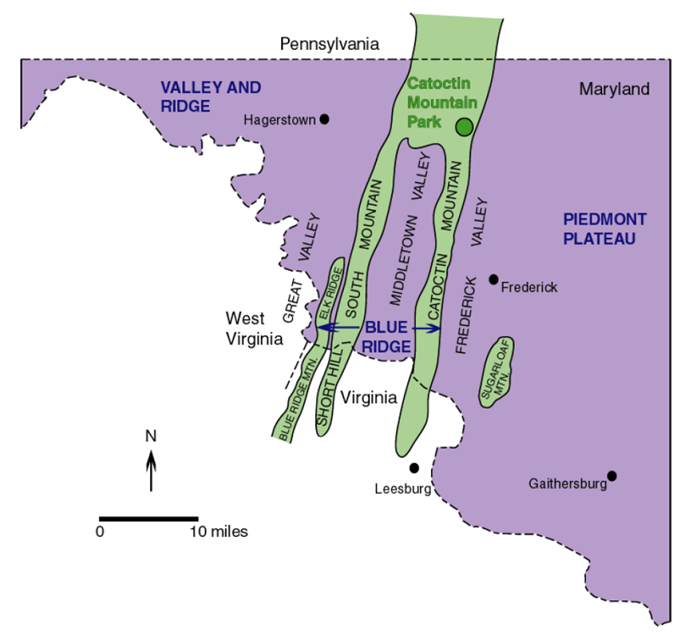 Figure 5-11 shows the location of the Catoctin Formation, comprised of a metabasalt breccia, which potentially could store CO2 from Maryland’s point sources. 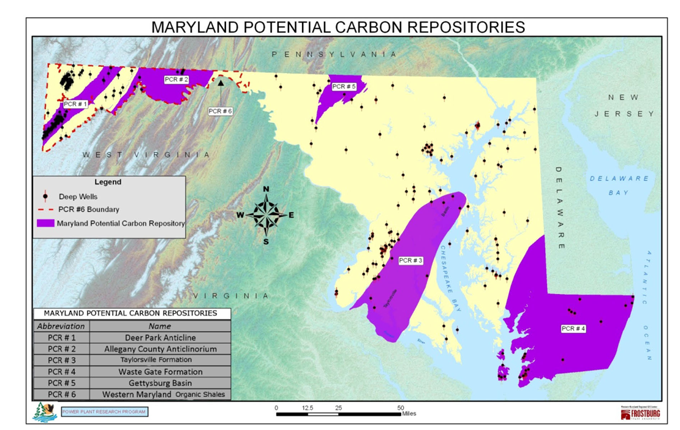 PPRP has identified six additional potential carbon repositories in Maryland (see Figure 5-12). Some geologic and geochemical information is known about these sites from previous oil and gas or other drilling activities. The MGS is now collecting additional information on the CO2 adsorption characteristics of these repositories to rank their potential to receive and permanently retain Maryland power plant CO2. The Survey has a plan to study the adsorption storage of CO2 in the exposed sedimentary basins of Maryland as a proxy for studying the CO2 adsorption characteristics of the deeply buried sedimentary basins where the cost of obtaining core samples is very high. This may permit a reasonable estimate of the adsorption storage potential of the important Taylorsville Formation where large natural gas fired power plants will remain in use in the future and transportation of their CO2 to the Appalachian Basin market may be an issue. In Maryland, the geology of the western portion of the state is particularly attractive for the possible storage and use of CO2. 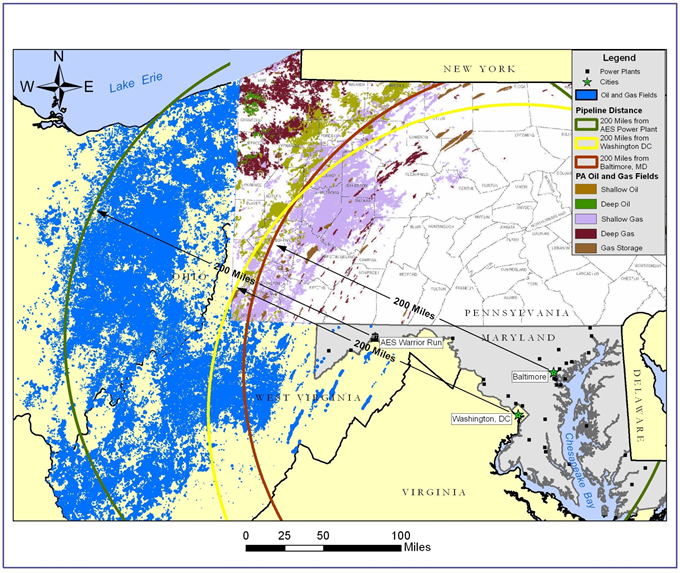 Figure 5-13 shows the location of gas fields in Western Maryland that could potentially be used for enhanced recovery of gas and associated CO2 storage, with the future potential economic use of the stored CO2 in enhanced gas recovery. Maryland also has several coal beds in Western Maryland that could potentially be used for enhanced recovery of coalbed methane and associated CO2 storage. While Maryland is not an oil producing state and thus does not have EOR projects within its borders, potential exists for captured CO2 to be transported elsewhere via pipeline for EOR projects. Precedent has been established for piping CO2 across state lines, and as previously discussed, Maryland’s current network of natural gas pipelines could hold potential for co-location of CO2 pipelines in the state. Maryland could possibly consider pipelining its CO2 to more regional EOR projects, such as those shown in Figure 5-14. If and when the CO2 market in Maryland develops, several potential projects exist that could potentially utilize this CO2. An example of a possible EOR project requiring CO2 is the East Canton oil field located in Eastern Ohio, which the state of Ohio has identified as a potential CO2 use candidate. According to the report, between 76 million and 279 million barrels of additional oil could be recovered from this oil field by CO2 flooding. The field was discovered in 1947, has produced nearly 100 million barrels of oil, and still has more than 1 billion barrels of oil in place. It is Ohio’s largest producing oil field. The CO2 for this potential EOR project would need to come from anthropogenic sources such as steel mills, power plants, cement kilns, or landfills, according to the report. While a host of significant economic and environmental issues would warrant thorough investigation and evaluation prior to initiating a CO2 pipeline project from Western Maryland power plants to Ohio, such a project could be worth considering if it were shown to be economically viable. The risks associated with geological sequestration of CO2 have been the subject of considerable study in the past decade and must be thoroughly evaluated when considering CO2 storage. Multiple escape mechanisms exist and could be greatly aggravated by seismic activity too minor to be felt on the earth’s surface. The significant risk of CO2 escape underscores the importance of the permanent sequestration of CO2 via adsorption. Although the concept of CO2 as a commodity has gained recognition, there are unresolved issues regarding CCUS projects. The issues of technology, infrastructure, and economics related to CCUS require continued research. Global policy issues involve the debate over CCUS as a worthwhile investment, and whether CO2 used for economic gain, such as in EOR, would be considered eligible for carbon credits. Technological issues suggest the need for further study to ensure that carbon is permanently sequestered and that the potential for future leaks is minimized. Based on the premise that Maryland can wait for a market to develop for Maryland-generated CO2 to be sold to the EOR and EGR industries in the Appalachian Basin, PPRP CO2 research is severely constrained. It is anticipated that fuel switching and other measures will greatly reduce CO2 production in Maryland. The United States leads the world in both the number of CO2 EOR projects and in the volume of resulting oil produced, largely due to favorable geology. The Permian Basin, located in West Texas and southeastern New Mexico, contains the vast majority of global CO2 EOR activity. In addition, a growing number of CO2 enhanced oil, gas, and coal bed methane projects are being launched across North America, effectively establishing a CO2 commodity market. Seeing the benefits of this use, DOE recently shifted the focus of its clean coal research program from CO2 storage alone to utilization in enhanced recovery. This beneficial use not only facilitates the production of otherwise stranded domestic oil and natural gas resources, potentially offsetting the large costs of CO2 capture and compression, but also sequesters significant volumes of CO2.